There always seems to be something going on. Each night after work and often on the weekends, Erin and I have got something great happening. What has been taking up so much time? Well, the most exciting thing is that this weekend we got to make a shopping trip. Yep! Erin and I made a little trip this weekend! Yes! The big day is drawing near! I am so excited I'm beside myself. Every day we fill in a new detail and each time we do it becomes more and more us. It is *possible* that Erin and I break from traditions...just a little. ;-) I can guarantee that we will post pics. I am easily the luckiest man in the universe. Erin is more than even I could have ever dared to dream possible. So what else? Well, my lady's books The Prophecy and The Outlanders were released in ebook format on October 21! This is a re-release for The Prophecy under a new publishing company, BookFish Books, and with a new cover; and a first-time release for The Outlanders. I am proofing the The Prophecy for its print release November 15th! There have been dozens of eyes that have helped proof these pages, but I am being uber-picky so the printed version is perfect. The pic above is a little glimpse behind the covers of what goes on to bring a book to print. My lady got purple and blonde highlights to celebrate the release of her books! If you don't know why she used purple...well, you'll just have to read her books to find out! 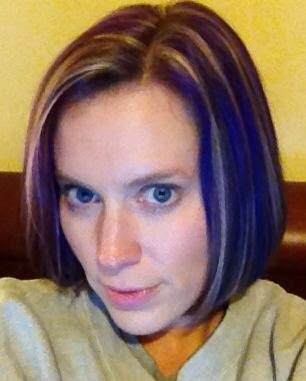 Erin Rhew goes all purple and blonde to celebrate her book releases! Erin and I have always been avid exercise enthusiasts but as of late we are having trouble making time. So, after having been in our house for a month...A MONTH!...we finally got our exercise equipment put together in the carriage house. Deek Rhew getting back in shape! 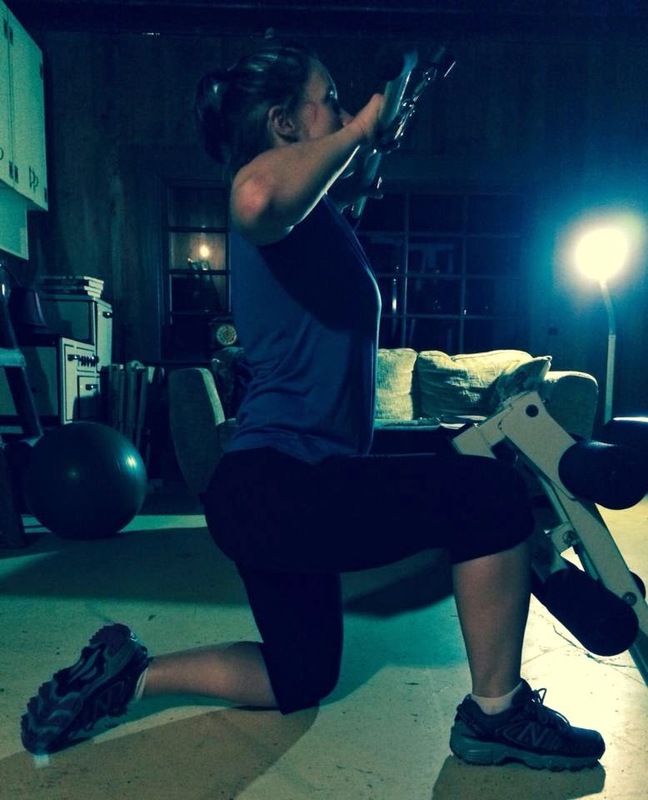 Erin Rhew busting out the reps! It totally feels great to be back at it! Though as you can see, winter is befalling and the sun is setting early. So lighting was a bit tricky. Of course, it's almost Halloween, so Erin and I went to the local Goodwill for, oddly, lamps and a tie. While we were there we browsed costume ideas. More deets by Deek are coming soon! Keep in touch. Also, take a few minutes to enter our contest to win! Posters and Signed Copies of The Prophecy and The Outlanders Giveaway!! 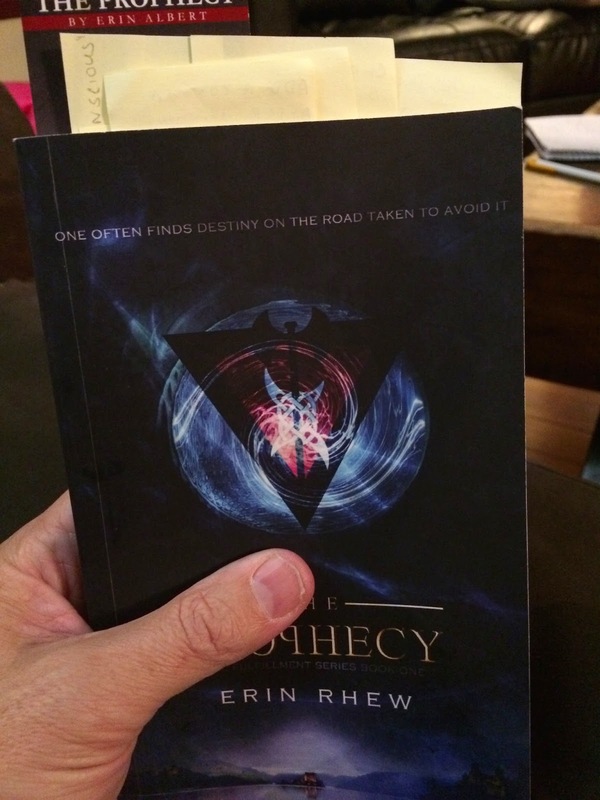 My lady, Erin Rhew, has just re-released her first book, The Prophecy, under a new name, under a new publisher, and with a brand new cover! In another month it and the second book in the Fulfillment Series, The Outlanders, comes out in paperback. The other day we had a date to go out to lunch so she stopped by my work, only we didn't leave right away. What kept us in the parking lot was a small box she'd received in the mail that morning. Together we opened the very first printed copy of The Prophecy. For those that dabble in the literary realm you know this is a huge deal. Her book has been out in digital format for a year now, but to hold the physical book in your hands is nothing short of phenomenal. Needless to say, I am BEYOND proud of my lady! This is a huge accomplishment. I flipped through the hallowed pages that Erin had spent years pouring her soul into the pages to create. In the back was a dedication to her fans, to her friends from The Dream Team that helped her edit, work through plot twists, character development, world building. These ladies helped her in a way that no one could ever repay, but the finished product was worth the effort. In addition was a dedication to yours truly that brought a tear to my eye. My love is just amazing. What we need now are followers on Facebook and Twitter. Since Erin and I are team she included me, even though my book isn't coming out until next summer (sssssshhhhhh I *may* have been picked up but right now the deets are on the downlow). My lady is posting the same contest on her blog, but with her own write-up. Stop in and give it a whirl. It's that easy! Enter to win my friends! It's quick and easy and you may just win a fantastic prize. You'll love what you read!! I was fortunate enough to receive an advanced reader copy of this book and sailed through its pages in record time. The Prophecy, the first book in the series ends on a cliffhanger, and The Outlanders picks up right where the other left off. I love it when an author hits the gas from page one, and in this case we are thrown right back into the scene. Even in the ensuing chaos, Ms. Rhew brings the reader up to speed subtly, reminding them of what was happening--in case it had been a while since they read her previous novel. Only it didn’t feel like a recap--something only a truly brilliant author is capable. This book has nuances and layer-upon-layer of brilliant intricacies woven throughout the tale. There is the love triangle, only it isn’t your typical angst-ridden mamby-pamby fantasy princess torn between two lovers. Our lady, Layla, is tough and fierce, and has had her feelings manipulated and twisted through spells cast by her enemies such that she doesn’t know what is real and what isn’t. The gents she’s torn between are noble and strong, loyal and driven, yet about as opposite as people can be. The ladies who have read Ms. Rhew’s books generally—and passionately—fall into one of two camps: Team Wil or Team Nash. After having read and loved The Prophecy, I have to say I think The Outlanders is a step up. Ms. Rhew seems to have really hit her literary stride and the story gets even stronger. Our understanding and knowledge of the characters becomes more intimate. We feel even more immersed in a fantastic world created by the power of her imagination. Though it leaves us with a cliffhanger that rivals the first book, the story’s 20th chapter left me emotionally spent and angry. The villain introduced in this book makes the one in the previous book look like Gandhi. This chapter gives you a glimpse into the depravity and depth of this person’s evil. I want to say more, to prattle on and on about the abuse one of my favorite characters was succumbed to at the hand of this antagonist, but I don’t wish spoil it. Only the most talented of authors can run me through the emotional obstacle course this book does. Happiness, anger, sadness, frustration, anguish, intrigue are all part of the Erin Rhew novel journey. NOTE: If you have not read The Prophecy, do NOT read this next paragraph. Please skip to the last one. So, to summarize how things stand at in the first chapter: Wil is dying and a battle is raging all around him. Mia, a woman claiming to be the Fulfillment at the very end of The Prophecy, is manipulating those around her. Her motives are unknown, but what is clear, is that she isn’t who she claims to be. Nash is attempting to run Etherea in his brother’s stead. Vespa has been mentally incapacitated by her father—perhaps permanently. A war between Etherea and Vanguard is ensuing because a rough boy-king, Vance, has assumed the throne. And Layla has no idea which feelings for Nash and Wil are real and which have been manipulated into existence by the evil Elder Werrick. Seems like enough, right? Well, for the average writer perhaps, but for Ms. Rhew it’s not. In the Outlands a new villain raises its head and overshadows all other problems. This nemesis is evil in a way Elder Werrick can only dream of being. So there is that on top of everything else. Many answers are revealed, but new questions are created. The twists and turns will have you guessing until the end. Oh, the end…did I mention that this book also ends in a cliffhanger? Sigh. So, bottom line: READ. THIS. BOOK. The Outlanders is now available on Amazon. Get it here! If you haven't yet read The Prophecy, get it here! 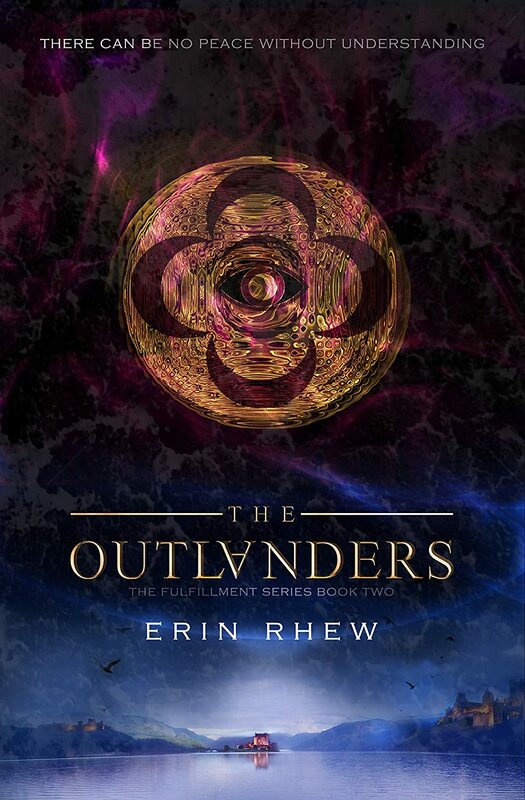 My fiancee and author, Erin Rhew, is releasing her second book, The Outlanders, today. She has been on book blog tour since Friday and, of course, I wanted to participate, but what do I post about? Last year, when she released The Prophecy, I did an author spotlight on her. I've read about Hollywood starlets that try and project a down-to-earth persona while being anything but. Is Erin who she seems to be on her blogs, Facebook, and Twitter? The quick answer to this is "No." In social media, Erin seems sweet and kind, smart, funny, and witty. The problem is that these only give you a glimpse into the wonderful person that she really is. Think about it like going to the mountains. <stick with me, this is going somewhere, I swear>. You park your car waaaaay up high and get out on a viewpoint. Below and all around you is a vast range of beautiful trees and snow-covered peak that go on into infinity. The air is clean, and the sun is warm on your face, countering the crispness in the breeze that tickles your nose and ruffles your hair. It's about as close to heaven as you can get on Earth. So you take out your cell phone and snap some pictures because you want to share this moment with your friends back home. Only, when you pull the images up on your computer, you are disappointed. Even though the pics are pretty, they don't begin to capture the serene beauty of the experience. That's what her social media presence is like. Completely amazing, fun, and loving, but it is pales in comparison to actually being with this beautiful lady. She has recently changed her pen name to Rhew. What's up with that? Did you have anything to do with it? Erin's maiden name is Rhew; that's where the name originates. We had been discussing changing my pen name from Jay Scott to something else because "Scott" is so common. 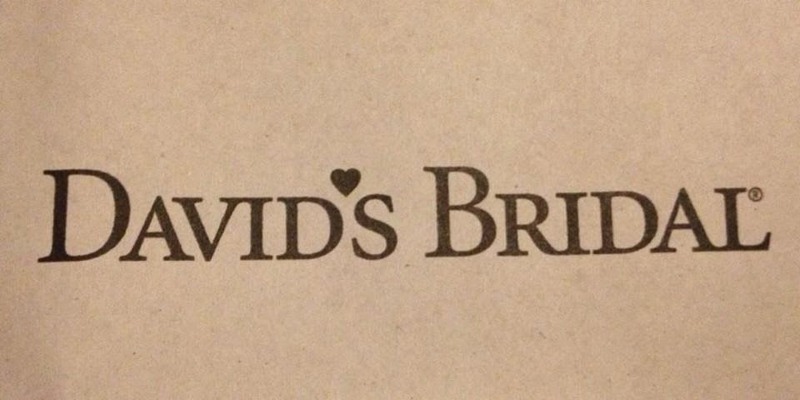 One day I asked her if she thought her dad would mind if I "borrowed" his last name. To say the least, he was overjoyed and granted me permission. Erin and I talked about it some more, and she decided that she wanted to link our professional names like we are our personal ones. To say the least, I was overjoyed, so we started going through the process of changing hers as well. 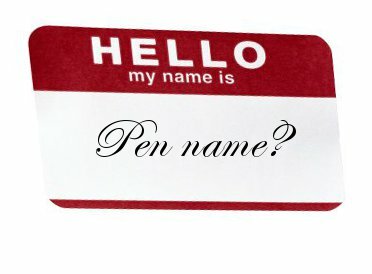 Changing one's name is no small task, and we wanted to have it done before The Outlanders came out. We've just about got this thang wrangled now. You can find her on her new web site, www.ErinRhewBooks.com, Twitter: @ErinRhewBooks, Facebook: Erin Rhew Books, Google+, Blog, and GoodReads. What future trials and tragedies to you foresee in Erin's future? There is a huge one looming in Erin's future, and I'm not sure how we are going to get through it. I know we will cross this raging river hand-in-hand as we do with all things, but it will be touch and go for a while. So what is this event that will rock her world? We found a sticker next to the Diet Pepsi with Lime at our local Fred Meyer's that says the soda is on close out. Yes, her beloved beverage of choice is being discontinued. You get to proof Erin's interviews, posts, books, etc. What is your grammar nerd fiancee's grammar weakness? She has trouble knowing where to place her hyphens. That sounds vaguely dirty, but I don't know why. Yes, re-reading that sentence makes me giggle. Does knowing where to place your hyphens make you feel all powerful? Yes. Every time I find one, I want to stand with my chest puffed out and my cape flapping in the breeze. It's really the only thing I can do grammatically that she struggles with. Otherwise, I'm just Jason Stackhouse, scribbling out novel-length emails full of run-ons, frags, unparallel sentences, and POV problems. Do you have any grammar nerd jokes between you? LOL! What a great interviewer you are! It's like you know us! As a matter of fact we do! Erin had to beat passive voice out of me. I've *almost* got it all out, but it has been a hard lesson. That being said, there are a couple of stubby little sentences I simply can't part with. If you ever say, "And it was short," I guarantee an eye roll and a chuckle from my lady. In addition, I have made it my life's work to get her to use the word "snicked" in one of her books. As in, "The door snicked shut." I am flagrantly abusing the word here, using it in a way that the creators never intended. And since she's called me on it, I have vowed to use it at least once in each of my novels. I accept 99.99% of her grammar corrections in my work, but this one--which I suspect grates on her nerves like fingernails on a chalkboard--I am holding fast. Muhahahahahaha! Give us an insight into her books. Share a smidge that has not been released to the public. So, here is a little tidbit that no one else seems to have picked up. She has said over and over that one of her favorite authors is Rick Riordan and that Percy Jackson is her, albeit under-aged, book boyfriend. Here is what you haven't read in the papers nor heard in the the news. Her character, Samson, is a nod to Rick's Percy. She has always enjoyed Percy's whit and sarcastic bite, and she gave Samson just a smidge of this same flavor. In addition, Rick helped Erin fall in love with Greek mythology. Her characters Haddey, Zed, and Poden are a nod to Hades, Zeus, and Poseidon. I'm a HUGE Shakespeare nut. So, the way Jesper behaves around his wife is my "hats off" to Shakespeare's observations of uncontrollable jealousy within the marriage from Othello. Erin claims to not like antiques, that she's a "modern girl," yet recently you moved into a 1895 Victorian house. Wut? Wut? Right? It's completely crazy! But we saw the house for rent, and no matter what we looked at, we kept coming back to it. Even more nuts, the owners are supposed to come back in June of 2015, so we may have to move again in a few months. But we love the house, the warmth, and the history. It felt like "home" even before we moved a stick of furniture or placed a single picture in it. The little town we live in has less than a 1000 residents and is charming and quaint. We just love the place, so we going with our hearts and enjoying this adventure together. You and Erin are engaged to be married. It is rumored that you met online. Truth or fiction! LOL! Oh, Deek, you know that rumors are rarely true, but in this case, it is completely accurate. Erin and I met on Twitter of all places! We became part of the same critique partners group, and I asked her to fix the grammar in my short story. Her passion for helping the handicapped made her agree. We started talking online, and in the comments of my book, and we never stopped. We communicated long-distance over FaceTime, and for a while, I was living on two coasts--Erin is a born and raised North Carolina girl. Now she lives with me in a rainy pocket of the Pacific Northwest. We are engaged and going to be married soon. Here is the deal, Deek. You never know where you will meet your soulmate. It could be in a cafe, in line at the grocery store, or on Twitter. The journey with her has been amazing, the best of my life. Even better, I am blessed enough to get to love this lady and spend the rest of my life with her. You don't know what's going to happen tomorrow, next week, next year, or heck, even later today. So, I'm embracing this lady and my journey with her, letting her know every day how much I love her and trying to give back just a bit of all that she's given to me. You are a very luck man! So you are in love with the author, does that make you biased about her writing? Probably a little, but really Erin's just an amazing author. Her storytelling leaves me breathless at times. Read chapter 20 of The Outlanders and then listen to My Immortal by Evanescence--this is the song she listened to over and over when she wrote the chapter--and try and not shed a tear. OMH! I limped away from that chapter torn and bruised. Her writing is strong and solid, her stories are creative, and her characters are relateable and real. So often I read her stuff and I'm like, "Damn, that's good. I wish I could write like that." So, yes, I may be a little biased, but really her writing is just amazing. Well, that concludes our interview. Thanks for joining me Deek! Thank you, Deek. I have greatly enjoyed our interview. You are an amazing conversationalist--funny and witty--and might I say, devilishly handsome. Back at you, my friend! Be sure to check out Erin's books, The Prophecy, and The Outlanders, on Amazon and follow her on Twitter, Google+, and Facebook. Also, add her books to your Goodreads "To Read" list! I love getting lost in a story. I can happily let hours slip by as I experience the lives of new friends and foes in exotic, unfamiliar worlds. I journey with them, experiencing their struggles and their triumphs, as they progress on epic adventures. A great storyteller will seize and hold my attention, make me happy or sad, excited or angry, all with the press of a key on their laptop. Erin Rhew wields such super powers. From the first word in the first chapter, her book captured my attention. Her debut novel, The Prophecy, enveloped me in a new and unique universe created by a very powerful imagination. Through its pages I lived and experienced the adventures of Layla, Samson, Grant, Nash, Wil, and a host of other relatable, complex characters. Chapter by chapter time sailed by and I found myself excited for my favorites' victories and angry at their treatment in the hands of their enemies. The only problem? The book ends in a cliffhanger and I, along with the rest of the world, am frustratingly forced to wait until the next segment, The Outlanders, is released to know what happens. Sigh. That, my friends, is fantastic storytelling. The tale starts up with 17 year old Layla Givens on her way to her town's annual celebration. Her people observe The Day of Dawning, a festive holiday that honors the First Ones--the founders of their religion. The city of Medlin is brightly decorated and a myriad of fun activities are in progress when the religious sect, the Ecclesiastics, arrive. Every year they perform the religious part of the ceremony, only this time things are different. The leader of the group, Elder Werrick, orders all the town decorations removed and the activities canceled, claiming these things are not a "proper honoring" of the First Ones. As the town decor is disassembled he meets Layla. Almost instantly he declares her the Fulfillment, the young woman foretold in their sacred scripts that would bring about peace between the different kingdoms. Layla is a Vanguard, a kingdom of fierce warriors that possess supernatural physical strength, and betrothed to Samson, another Vanguard. She is told by Werrick she will marry the Prince of the Ethereals, a kingdom of people that have the power to alter minds: the ability to both project images and remove memories. These two countries are sworn enemies of one another and have been warring for centuries. She tries to fight this declaration and her capture. Only the Ecclesiastics have imprisoned Samson and other members of her family and are threatening them to ensure her cooperation. Thus setting the scene that creates unlikely allies, hidden dangers, romance, anguish, and many epic battles. The tale is told in a strong, formal voice, like nothing I've ever read before, and have come to think of as the Erin Rhew Style. Filled with noble princes and princesses; deep and complex characters; manipulative, merciless antagonists; and plot twist after plot twist, The Prophecy will keep you guessing. Then of course there is the cliffhanger ending. But I digress. Erin and I have been busy these last couple of months! Like, completely-let's-turn-the-world-upside-down busy! One of the biggest is that we sold our gluttonous behemoth house and moved to a 1895 Victorian rental. This place is beautiful with a ton of character, warmth, history, and no-A/C. Yeah, that is taking some getting used to, but really, does this look like a place where authors should live or what? I came home the other day to find the gardeners working in the yard and the handyman cleaning the gutters. 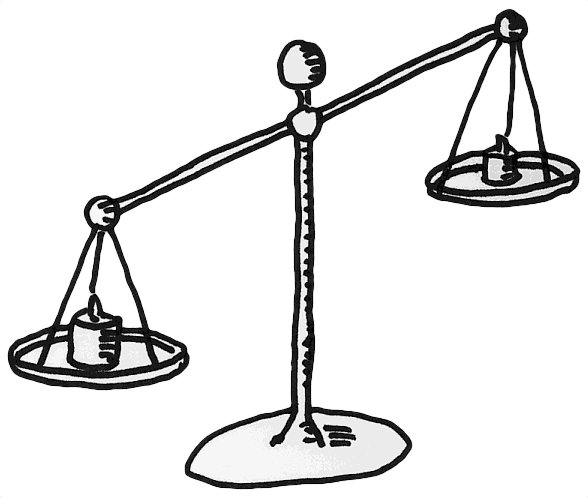 All part of a renter's life? Ummmm yes, please!!! But it is not all peace and dancing in Jamestown. Inside lurks a villain clad in steel and chrome. This beautiful but malevolent piece of hardware (an AGA stove) is the devil of complication. There are four knobs, yes FOUR, to run the oven. Choose the wrong setting and your pizza comes out raw on the bottom and black on the top. We still ate this. It was 1:30 in the morning and we were a bit punch drunk from unpacking. We laughed our heads off at the ridonkulously complex contraption that made this pie reach its full potential. I'm not sure why this oven is kicking our butts so completely, but we are tenacious and will tame this beast! Whipsha! In addition to moving, we joined the German Secret service. Hats and lederhosen are required. My lady is a true-born southern girl and I have been preparing for her first winter in the Pacific Northwest. Here she is in her very first North Face coat. My southern girl sporting a northern look. Of course, with all that's going on I couldn't keep my old job. I loved my previous occupation, but the commute was hideous. So I found something a bit over five minutes from our house. Now I can go home for lunch, meet my lady for a run, and, on occasion, I find little notes on my car because someone can swing by on her way to the store. Looking beautiful and elegant in formal wear! There is more, of course!, so keep on the lookout. Stop by Erin's blog and read more about the Rhew-in-nations adventures. For now, have a great day y'all!